In the quest for 'development' we're pretty cavalier about bulldozing whatever is in the way and putting up houses, big box stores, highways, condos, or whatever else in the name of development. What if its already developed? Habitat destruction is the biggest of the five major pressures on our ecosystems. 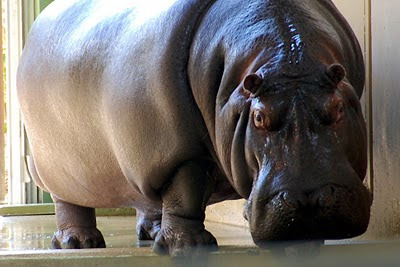 Conservation biologists abbreviate those threats HIPPO: Habitat Destruction, Invasive Species, Pollution, Population, and Overharvesting. The existing tenants, the plants and animals that live there can't defend themselves very well in the courts. They're not very good at filing out the paperwork. If they're to have any chance, we're going to need to think for them, and it's in our interest to do so. Ecosystems have evolved in place over thousands of years and have become precisely adapted to the natural forces at play. Those forces balance each other and continue the cycle of life. Our national and provincial parks provide a good way for us to recognize areas we want to protect. That shouldn't mean that the rest of the planet is free for the taking though. Intact ecosystems are really good for business. The services they provide are the ones we take completely for granted. Things like clean air and water come from intact ecosystems. Even though you can probably get your municipality to approve whatever development you have in mind, that doesn't necessarily make it right. Consider the long term value of what already exists on the property you are considering. There's always another way to solve your problem. It may take a little more creativity, ingenuity, or guts, but you can find a better solution. The creative, innovative solutions also tend to be more attractive to a marketplace that is becoming more sensitive to green issues. If you're thinking of developing, consider how you can redevelop inside an already impacted area so that you're not contributing to habitat destruction. If you're not developing, make sure you ask these sorts of questions of people who are, and choose to live in redeveloped neighbourhoods, not the new ones on the edges. They build it because we buy it. Changing your purchasing decisions to reflect your beliefs is a good way to send a message. This will reduce your impact on the ecosystems we need, and help keep the planet in good shape for generations to come.